In some learning management systems, you may need to first create learner accounts within the LMS and then assign learners to the appropriate content. 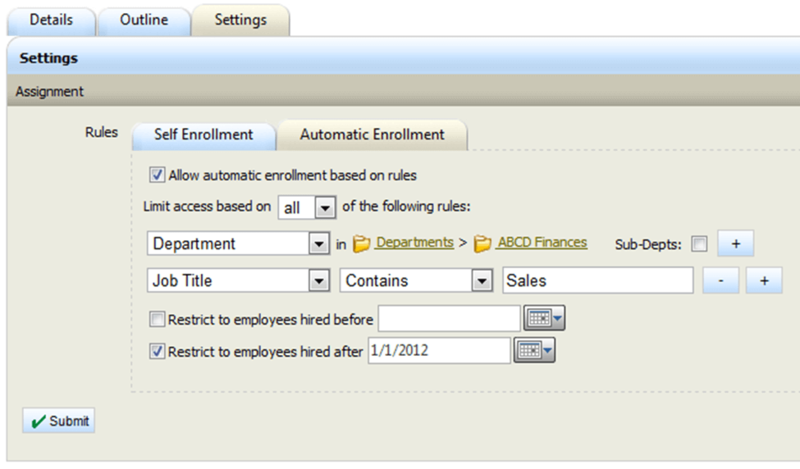 In others, you can create rules related to access to content and course enrollment prior to the creation of learner accounts. So, depending on your system, this step may be step eight or step nine in setting up your LMS. For the sake of this post, we’ll assume we can create enrollment rules first and then create the learner records. The advantage of this approach is that learners will automatically have access to the relevant content the minute they are registered within the LMS. There will not be a delay between the time they are registered in the system and the time they receive notification that they have access to content. Once again, the work you did on the content inventory document will make this step very easy. You’ve already identified who needs what content, and whether that content will be assigned to that group of learners or simply placed in a course catalog for the learner to select if they wish. You now simply need to create those assignments within the LMS.